5 out of 10 Editor's Picks are hand-made headphones from tiny Grado Labs in Brooklyn, NY. Imagine a consumer magazine… yes, that one. Half of their top ten headphone selections are Grado headphones. For years, Grado headphones have been among the best kept secrets in state-of-the-art sound reproduction, but it's a secret no more. In a remarkable feat, Grado out-ranked all of the better known brands, and was named to five of the top ten slots in America's best known consumer magazine. Better yet, they are all available at unbeatable prices from 4OurEars.net - The Official Grado Store. These are hand-made headphones, and lest you think they're prohibitively expensive consider this: the $99 Grado SR80e out-ranked headphones from Shure and Sony costing three times as much. Grado's phenomenal ranking is sending shockwaves through the headphone industry. No brand of headphones has ever captured so many of the top ratings at once, with Grado products in 5 of the top 10 spots on the list. The next-closest competitor had two spots. It is clear that Grado lives up to their motto "Truly The World's Finest", earning recognition as one of the most important headphone manufacturers in the industry. John Grado, President of Grado Labs, was understandably excited. "Here at Grado we are popping the champagne corks and toasting. The top consumer rating magazine in the world has come out with their latest list of the top home/studio style stereo headphones under $350. We are honored to have numbers 1 and 2 but flabbergasted to have 5 of our models selected in the top ten of that list. Five out of the top ten is the most any manufacturer has ever received. Raising our glass, here's to us"
What makes Grado headphones different? They take a boutique approach to their business. Grado Labs is a family-owned operation which has worked out of the same basic facility in Brooklyn since 1953. The vast majority of their products are hand-assembled in that very same facility. While this limits the number of units in any product line, it allows them to have quality assurance levels far in excess of typical assembly-line products - particularly compared to those assembled overseas. 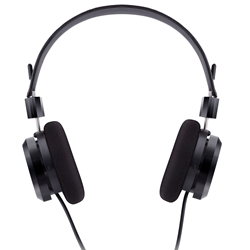 4OurEars.net is proud to carry the full line of Grado headphones and other audiophile-grade hardware. As the official home of Grado products online, every purchase from 4OurEars is fully guaranteed to be an official product, and comes with the full USA warranty. With so many knockoffs and gray-market products on the market today, this is a vital distinction for consumers who want to make sure they're getting the best headphones available. Consumers are encouraged to visit 4OurEars.net to experience the best headphones Grado has to offer. 4OurEars.net is the official home of Grado products online. Through 4OurEars, music lovers can purchase officially-warrantied Grado headphones and phonographic equipment, and with free domestic shipping. 4OurEars is also the only authorized Amazon reseller of Grado products.